Romania Central offers you everything you ever wanted to know about Romania: Get all the information on one site. Romania Central is proud to provide you with an unique range of economy analysis, statistics, images, addresses and contacts. 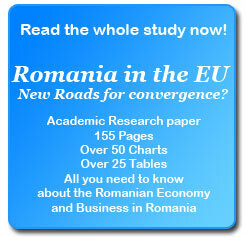 The next section to be filled concerns business and the exciting business environment in Romania. Read how business in Romania is done, what are the best opportunities and how to run your own business in the emerging Romanian market. Beside the general macroeconomic profile of Romania you will find a detailed analysis of Romania’s economy for all development regions of Romania. The economic strenth and weaknesses of each Romanian development region is given, a profile of the regional economy and business environment. Recently added and currently under development is the tourism section about cities in Romania, starting with the city of Brasov and the capital of Romania Bucharest.